The State of Israel is responsible for enforcing the Convention on the Rights of the Child in Israel as well as in the Occupied Palestinian Territory. In fact, according to the International Court of Justice it is – as the occupying power – responsible for the human rights situation in Palestine as well. However, the Israeli state refuses to recognize this obligation. Consequentially, numerous child rights violations have taken place and remain unpunished. In the armed conflict between Israel and Palestine, many fatalities have been reported among Palestinian children, innocent victims often killed by mistake but sometimes callously shot by Israeli soldiers for no reason. In the Gaza Strip where Israel declared war against Hamas, various Israeli confrontations and raids have resulted in the deaths of numerous children. The attacks often target public places that have turned into refuges for civilians, like schools, hospitals, etc. In addition to the lost lives, tens of thousands of children are injured and some are left disabled for life. “Flashbacks, nightmares, agoraphobia: even children are not spared from the repercussions of war,” UNICEF lamented after conducting a study about children living in the Gaza Strip. They are traumatized, with 88% afflicted by fear. Hamas no longer hesitates to use Palestinian children from the Gaza Strip in active roles in its battle against Israel. For example, on one website, Hamas glorifies and persuades children to commit suicide to defend the Palestinian cause. With the slogan “death for God is victory,” children are encouraged to actively engage in conflict at the cost of their protection and right to life. 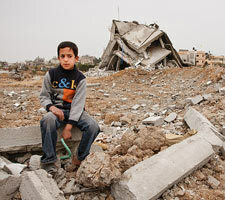 Additionally, the Palestinian occupation by Israel impacts children’s everyday lives. Palestinian authorities are greatly dependent on international aid, financial resources are limited and public services are not up to standard. 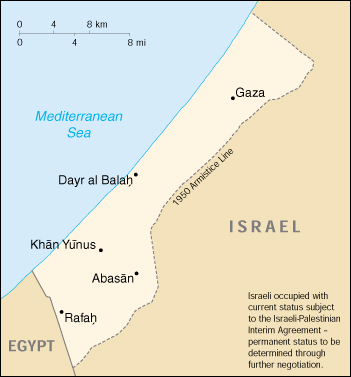 The wall – or fence in some places – zigzags through the West Bank, greatly affecting accessibility to education, water, health care and economic development for the country (see subsequent sections). Moreover, reports from non-governmental organizations show that Israel has used force to suppress pro-Palestinian demonstrations, using tear gas and shooting into the crowd without hesitation, even where there are children. The Israel army has defined a stone as a dangerous projectile in the same category as a real bullet. So if a child throws a stone at an Israeli soldier, the latter can respond in force and the child can be sentenced to up to 20 years in prison. Israeli restrictions on the free movement of people and goods are major obstacles for the Palestinian economy. In 2012, the unemployment rate was 27% and according to recent statistics, 26% of Palestinians live below the poverty line. In Gaza – the most impoverished area – one in two adolescents has the chance to work. The effects of poverty on children’s lives are numerous: their schooling often remains incomplete because they leave school at a very early age, usually to work and provide for the needs of their families. Early marriages of young girls and adolescent crime are both consequences of poverty. 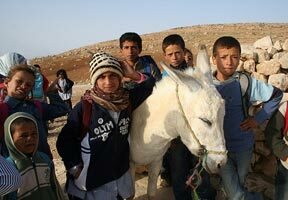 In Palestine, approximately 70% of children go to primary school. Access to education is difficult for children who live in refugee camps and villages that do not have a school. According to a 2013 UNICEF study, more than 2,500 children within educated communities travel through at least one checkpoint per day to go to school – a situation that contributes to school dropouts and child labor. Furthermore, the number of classes offered is insufficient, which leads to overcrowding, teaching is of the poorest quality and the schools lack resources and materials. In Gaza, following Operation Cast Lead in 2012, many schools were damaged or destroyed. In 2013, more than 123,000 children had to discontinue their schooling according to UNICEF. In Palestine, the infant mortality rate is seven times higher than that of Israel. Indeed, 30% of Palestinian children die before the age of five. The causes of this high infant mortality rate are varied: anemia, nutritional deficiencies or even severe malnutrition. Access to health care services can prove extremely problematic in Palestine due to the presence of the wall and checkpoints. Testimonies have been recorded of cases where families found themselves blocked by the Israeli army when they wanted to go to a hospital for treatment of their sick children. Sometimes, if medical treatment is delayed, the outcome can be fatal. During the conflict, many hospitals or clinics were also destroyed, depriving children of their right to health. With water resources being very limited, hygiene is often marginalized in favor of satisfying vital necessities (eating and drinking). Otherwise, the consumption of non-potable water also leads to severe sicknesses in children (diarrhea, hepatitis, etc.). In 2013 in the West Bank, more than one million Palestinians had to manage with approximately 60 liters of water per day per person, which is well below the 100 liters per day per person recommended by the United Nations. 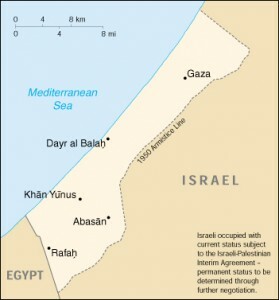 In Gaza, 95% of the water is unsuitable for human consumption. It is so polluted that it is estimated the territory will have no more drinkable water by 2016, an effect that will be irreversible by 2020. The high level of nitrate (notably due to poor management of wastewater) is the source of many sicknesses that affect babies and children. 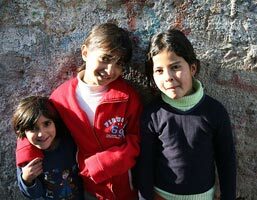 Even though the legal age of maturity is fixed at 18 years old, child marriages are still commonly practiced in Palestine since one in ten girls are married between 15 and 19 years of age, with 2% of those marriages occurring before the girl is 15. These marriages can have negative effects on young girls who do not know what the consequences are. In fact, more often than not, after getting married the girls must become wives by looking after the housework and their husband. Additionally, following these marriages the girls frequently become pregnant and have to then take care of their offspring, even though they are still children themselves. Women and girls continue to be victims of discrimination. They are particularly affected by “honor killings.” Even though these crimes are punishable under law, men often only serve a short sentence and the victims’ cries for help fall on deaf ears.